It’s that time of year again – time to ditch the treadmill and head outside for some good old shoe to pavement running. The warm weather and sunshine could have you feeling more energetic and, in turn, boost your activity level. This change in pace makes it a perfect season to reevaluate your training and recovery regimen to get the most out of your tough workouts. Effective post-run recovery is an easy way to ensure your body receives what it needs to bounce back while reducing risk of injury. If you’re a runner, you may know how critical the 30-45 minute time frame after a strenuous workout is to maximizing the benefits of recovery. But what exactly should be done during this time? 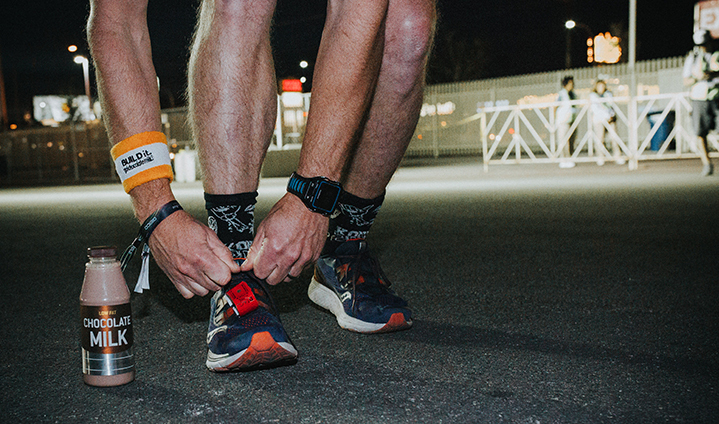 An ideal regimen will help recover and refuel many aspects of a runner’s body – from replenishing electrolytes and refueling exhausted muscles to strengthening bones. An easy way to ensure your recovery hits these points is to dial in on nutrition. For runners, that means not only looking at what you eat after a workout but also what you drink. There are many factors to consider when creating a post run recovery plan for after those long runs. Luckily an elaborate regimen is not necessary to see results – it can be as simple as including lowfat chocolate milk after running. Plus, it’s delicious! When planning post run recovery, athletes should consider differences in drinks’ nutrition. For runners, the nutrients should provide both immediate and long-term benefits. 20+ studies support the well-rounded recovery benefits provided by chocolate milk. The drink’s 3:1 carb to protein ratio is scientifically proven to replenish muscle glycogen (muscle fuel) and the high quality protein helps repair and rebuild exhausted muscles. Recent research suggests that milk rehydrates and helps maintain hydration better than water and other popular recovery drinks for runners while simultaneously replenishing electrolytes lost in sweat, including calcium, potassium, sodium, and magnesium. Chocolate milk after running not only provides immediate recovery benefits, but also 9 essential nutrients your body needs. Vitamin A supports a healthy immune system while calcium, vitamin D, phosphorus, protein, and potassium build and maintain strong bones, which can help reduce the risk for stress factors. Plus, there are B vitamins to help your body convert food into energy. Proper recovery and nutrition can help reduce likelihood of missed training days due to illness or injury, so you can stay at the top of your game. Recovering with chocolate milk after running may help athletes boost their performance. One study found drinking fat free chocolate milk after a hard workout helped runners reduce muscle breakdown, build more muscle, and run longer in a second exercise bout later the same day. In this study, runners who recovered with chocolate milk, on average, ran 23% longer and built 38% more muscle than runners who recovered with a carbohydrate-only sports drink with the same amount of calories. Although the science behind post run recovery is complex, your recovery drink doesn’t have to be. With high-quality, natural protein to build lean muscle, fluids to rehydrate, electrolytes to replenish what you lose in sweat, calcium for strong bones, and a carb-to-protein ratio shown to refuel exhausted muscles, lowfat chocolate milk provides well-rounded recovery benefits for runners. It’s that simple.